Physical Description: Tall, athletic pitcher's frame. Has some projection left and should add strength as he matures. Mechanics: Throws from a low three-quarters arm slot, starting on the first base side of the rubber. Steps toward third base and finishes with back leg continuing in that direction. Used to step even more towards third and then swing back leg around toward first base, coming across his body with a lot of east-west movement, but has worked on staying squarer to the plate with very obvious improvements. Very quick arm. Long arm action including elbow climb in the back and high leg kick. Mechanics are very tough on right-handed hitters. Unique delivery (which used to be even moreso) with a lot of effort, but it works for him. Fastball: 93-96 mph. Tops out at 98 mph. In college, worked almost exclusively off a two-seam fastball regarded as among the best in the 2017 draft. At beginning of 2018, organization worked with Houck on instead relying primarily on a four-seam fastball, based in part on Trackman data on the pitch. After struggling in the first half of the year, returned to primarily throwing the two-seam while mixing in the four-seam more than he once had. Two-seam shows arm-side run and heavy sink down in the zone. Houck does not command the four-seam as well. In Spring Training 2018, threw the four-seam routinely in the 95-97 mph range, but as with earlier looks, the pitch was straight and was hit hard when in the zone. Better as a pitch to mix in and change the batter's eye level on occasion. Now throws the pitch at about the same velocity as the two-seam. Potential plus pitch. May add a cutter eventually. Slider: 83-86 mph. Has returned to throwing the sweepy, frisbee like 10-to-4 slider he used in college and after being drafted. Tried out a spike curveball grip during the first half of the 2018 season, but because of his arm angle the pitch wasn't a good fit. Has shown great confidence in his slider willing to throw it to right- and left-handed hitters. Can locate in and out of the zone, has bat missing potential. Potential plus offering. Changeup: 86-88 mph. Inconsistent pitch, has changed his grip on the pitch as a professional. Pitch will flash drop and deceptive arm speed, but has trouble turning the pitch over and often is firm and straight. Still a work in progress. Clear third pitch. Potential average offering with significant refinement. Career Notes: Pitched for U.S. collegiate national team for two summers at Missouri. 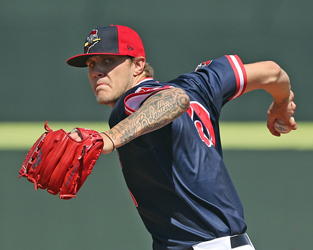 Perhaps a poster child for the Trackman era, the Red Sox development plan after drafting Houck has included an overhaul of his arsenal and mechanics despite his being a first-round pick in an effort to increase his chances of staying in the rotation. Experimented with primarily throwing a four-seam fastball in early 2018 that he now will mix in with the two-seam and has changed grips on his breaking ball and changeup. Participated in 2018 Fall Instructional League. Summation: Projects as a late-inning reliever, with a chance to develop into a mid-rotation starter if he can develop another secondary pitch to complement his slider and refine his fastball command. Has the size and demeanor you look for in a pitcher; able to bear down when necessary. Fastball and slider project as potential plus pitches. Changeup lags behind, but has shown potential against left-handed hitters, which will be vital given his low arm slot. email: info@soxprospects.com SoxProspects.com is in no way affiliated with the Boston Red Sox, Pawtucket Red Sox, Portland Sea Dogs, Salem Red Sox, Greenville Drive, Lowell Spinners, GCL Red Sox, Major League Baseball, or Minor League Baseball..